Paul Krugman is a Nobel Memorial Prize winning economist and also happens to be a smart man. In today's NYT Krugman has an Opinion piece titled, "Sympathy for the Luddites," in which he carefully explains that, "highly educated workers are as likely as less educated workers to find themselves displaced and devalued [by new technologies], and pushing for more education may create as many problems as it solves." Unlike Robert Reich, who as recently as this year was still speciously asserting that "A strategy designed to increase jobs and wages…would focus on raising the productivity of all Americans through better education—including early-childhood education and near-free higher education," Krugman--being a smart man--tells the truth: "Education, then, is no longer the answer to rising inequality, if it ever was (which I doubt)." But as smart as Krugman may be, his pay, not to mention his prestigious platform at the New York Times, comes with a string, or rather a steel cable, attached; the deal is, "Say all the smart things you want, in order to maintain your credibility with other smart people, but don't you dare talk about a realistic solution to things like unemployment and economic inequality, because that would entail Thinking about Revolution." "So what is the answer? If the picture I’ve drawn is at all right, the only way we could have anything resembling a middle-class society — a society in which ordinary citizens have a reasonable assurance of maintaining a decent life as long as they work hard and play by the rules — would be by having a strong social safety net, one that guarantees not just health care but a minimum income, too. 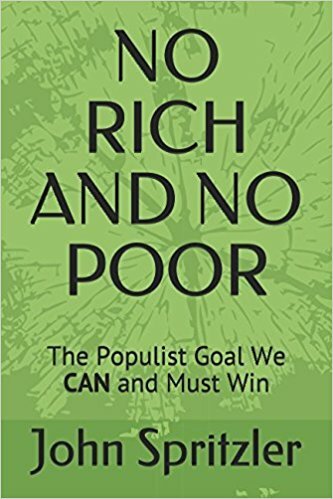 And with an ever-rising share of income going to capital rather than labor, that safety net would have to be paid for to an important extent via taxes on profits and/or investment income." Who will bell the cat, indeed, Mr. Krugman? "I can already hear conservatives shouting about the evils of 'redistribution.' But what, exactly, would they propose instead?" This is the kind of language the plutocracy allows, language that presumes "responsible" (meaning non--revolutionary) methods only must be used to forward one's agenda. Thus Krugman implies that the task is to persuade conservative politicians to "see the light." Krugman also honors his side of the deal with the ruling class by focusing on "conservatives" as the obstacle to his "solution," thereby implying that liberal politicians are sympathetic to the "solution" and would implement it if only they could get support from the conservatives. The reality--that we need a revolution to solve the problems that the plutocracy creates--is totally excluded from Krugman's language. It's not as if the United States were a real democracy, in which ordinary people can just enter a ballot booth and "bell the cat" that way, is it, Mr. Krugman? Krugman writes as if all it takes to "bell the cat" is for Americans to decide they'd rather dump all of the laws and policies of both the government and private corporations that have been causing economic inequality and insecurity to grow dramatically for many decades, and vote in "representatives" to carry out their wishes. If this were the case we'd have had "Medicare for All" (a.k.a. single payer) health insurance for everybody long ago, without being forced to pay huge premiums to big profit-taking insurance company middlemen who only cause our health care costs to be more per person than in other nations, wouldn't we, Mr. Krugman? After all, this is what Americans have been saying they want, in the ballot booth and to opinion pollsters, for decades. As a smart man like Mr. Krugman probably knows full well, a plutocracy rules the United States, and it has no intention of making the United States a "middle-class society — a society in which ordinary citizens have a reasonable assurance of maintaining a decent life as long as they work hard and play by the rules." The last time the plutocracy toyed with that idea just a little bit, the period from FDR's New Deal to LBJ's War on Poverty, it was out of fear of a revolution happening if they didn't do it, and aside from preventing a revolution it was a disaster from the point of view of the plutocracy. Americans came to have rising expectations and many of them felt economically secure enough to think about fighting to make America a more equal and democratic society. All hell broke out, as anybody who lived through or has read about the radical upheavals of the "1960s" knows. How profoundly the 1960's affected the thinking of elite leadership can be seen in the writing of Samuel P. Huntington, Professor of Government and Director of the Center For International Affairs at Harvard University, and co-author of The Crisis of Democracy: Report on the Governability of Democracies to the Trilateral Commission written in 1975. Huntington's Report noted that, "The essence of the democratic surge of the 1960s was a general challenge to existing systems of authority, public and private," marked by a "sharp increase in political consciousness, political participation, and commitment to egalitarian and democratic values." What especially frightened the elite was the fact that, as Huntington wrote, "In recent years, the operations of the democratic process do indeed appear to have generated a breakdown of traditional means of social control, a de-legitimation of political and other forms of authority... The late sixties have been a major turning point." The Report concluded: "Al Smith once remarked that 'the only cure for the evils of democracy is more democracy.' Our analysis suggests that applying that cure at the present time could well be adding fuel to the flames. Instead, some of the problems of governance in the United States stem from an excess of democracy... Needed, instead, is a greater degree of moderation of democracy." FDR's National Recovery Administration chief, General Hugh S. Johnson, went to San Francisco and declared the general strike a "menace to the government" and a "civil war." And Senator Hiram Johnson, California's "elder statesman" declared, "Here is revolution not only in the making but with the initial actualities." The credible threat of revolution forced the plutocracy to buy time with the "carrot" strategy initiated by FDR's New Deal. But the plutocracy never intended to create, never mind maintain, the "middle class society" of Mr. Krugman's dream. Since the mid 1970's the plutocracy has been implementing policies that increase the insecurity of working people and increase economic inequality. Why do they do this? They do it in part to prevent rising expectations leading to another radical upheaval like the 1960s, and in part simply to enrich themselves at the expense of the working class--what they always do as much as they think they can get away with without provoking a revolution. The only thing that will make the plutocracy shift again, if only temporarily, to the "carrot" strategy of social control (which is, essentially, what Mr. Krugman is dreaming of as his "solution") is a credible threat of revolution; and the only thing that can create a truly decent egalitarian and genuinely democratic society is a successful revolution to remove the plutocracy from power, entirely. To believe otherwise, as Mr. Krugman pretends to believe in his Opinion piece (because the terms of his employment require it), is as stupid as to believe that the cat would bell itself! Mr. Krugman used the Luddites of 18th century England to make a point in his Opinion piece. The Luddites were part of an anti-capitalist tradition that included the 17th century Diggers, who explicitly aimed for a free and equal society based on mutual aid, in which "The earth [would be] a Common Treasure House for all." Mr. Krugman will never say it, but we need to create a world based on their vision, and to start Thinking about Revolution. 6. Arthur M. Schlesinger, Jr., The Age of Roosevelt, Vol. III, The Politics of Upheaval, Houghton Mifflin Company, Boston, 1960, p. 325.